The unfunded liabilities of Social Security, Medicare, and Medicaid are often omitted from discussions about the large size of US public debt. Once these are taken into consideration, it becomes clear that the US government is clearly on an unsustainable path. This chart places the US debt into proper perspective by comparing various estimates of the nation’s unfunded liabilities to the official debt and deficit estimates. Fiscal policy discussions generally focus on the current year’s budget numbers: $1.0 trillion budget deficit and $16.0 trillion national debt. Former chairman of the SEC Chris Cox and former chairman of the House Ways & Means Committee Bill Archer (2012) report roughly $87 trillion in unfunded liabilities using data from the Medicare and Social Security Trustees’ Reports. Their measures account for the unfunded liabilities—including Social Security, Medicare, federal workers’ pensions—in addition to the official debt. Boston University economist Laurence Kotlikoff calculates a “fiscal gap” amount of $222 trillion using the Congressional Budget Office’s alternative long-term budget forecast. The fiscal gap measure takes into consideration the present value of all the expenditures now through the end of time (including servicing the official debt) and subtracts all the projected taxes from that amount. This means that the government would have to invest $87 trillion or $222 trillion right now in something that will earn a certain positive rate of return in order to meet its future obligations, mainly with respect to entitlement programs. Both alternative debt figures dwarf the $16 trillion official debt figure, even when you add the $55 trillion Treasury estimate for unfunded liabilities to total $71 trillion. This money is not due in the future; it’s like a credit card bill the country owes right now. If we don’t pay interest on it, the debt will continue to accumulate. Addressing our unfunded liabilities problem requires fundamental entitlement reform and reductions in federal spending. Data note: Official debt and deficit figures are from the Office of Management and Budget. Official unfunded liabilities estimate comes from the US Treasury Department. 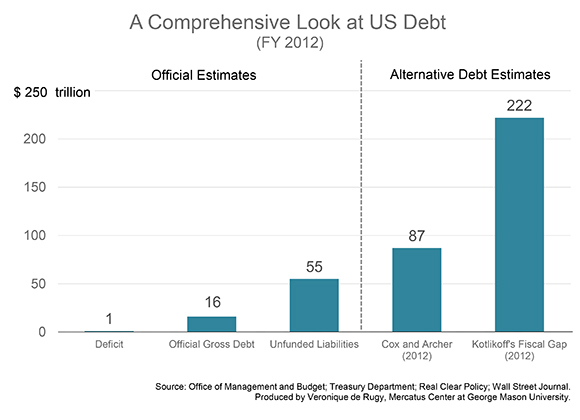 The Cox and Archer (2012) figure is from a November 2012 Wall Street Journal article, “Cox and Archer: Why $16 Trillion Only Hints at the True U.S. Debt.” The Kotlikoff Fiscal Gap figure is from Laurence Kotlikoff’s several editorials and commentaries from 2012.